We manufacture blends of Admixtures high reactivity pozzolonic materials (HRM) for improving quality of concrete and plaster. Available in 50 kg / 25 kg packing, these are offered at highly competitive prices. Usage Concrete additive - Roads, Slabs, Pavements, etc. 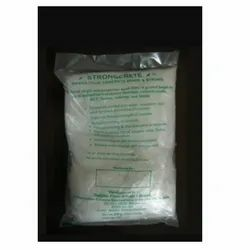 Fibrillated Mesh Fibres (STRONGCRETE) is a chemically surface treated 100% Virgin high tenacity fibrillated polypropylene mesh fibre based concrete additive and is available in graded lengths. It provides 3D micro-reinforcement to concretes. It is used @ 0.9 kg per m3 of concrete (minimum). STRONGCRETE complies with ASTM C 1116 and ACI committee report 544-1R. Reinforcement against shrinkage and intrinsic cracking. Replaces welded wire mesh / secondary crack control steel used for crack prevention of concrete floorings. Reduces permeability, thus reducing water ingress and protects reinforcement steel from corrosion. Makes the concrete more durable & tougher. All types of concrete, where toughness is required along with elimination of shrinkage cracks and other desirable characteristics as mentioned above. Dosage: Minimum 0.9 kg /m3 of concrete. Water Cement Ratio : STRONGCRETE is a physical micro-reinforcement and does not react chemically hence additional water is not required. Mixing Process: Mix directly in the concrete mixer @ 125 g /50 kg bag of cement or 0.9 kg/m3.